If you're interested enough in school Management Information Systems (MIS) to to read this blog, chances are you already know that Capita's SIMS dominates the English market. What may surprise you - particularly if you went to BETT this year and saw the many shiny stands promoting rival vendors - is just how hard others are finding it to establish themselves. Over the past five years, SIMS has actually managed to grow its footprint slightly, rising from an 82.1% market share in 2010 to 83.1% in 2014. Pity the poor blogger who attempts to spot exciting trends behind that headline story. So, after wading through the numbers, here are my main insights. RM is now the nation's clear second-favourite MIS. Since 2010, RM has increased its market share from 7.3% to 8.6%. That's almost 2,000 schools using their system. And, significantly, the third and fourth favourite suppliers from 2010 (Advanced Learning and Pearson respectively) have dropped away since then. AL has declined from 6.4% to 5.1%, and Pearson have exited the market entirely. Scholarpack has finally broken the 1% market share barrier, but in the big picture, everyone else is still a rounding error. Cloud suppliers are steadily gaining market share. It's hardly a revolution, but those suppliers who ARE gaining share are doing it from the cloud. RM (1,586 schools in 2010; 1,894 in 2014), Scholarparck (0; 244), Bromcom (5; 85) and Arbor (0; 66) now have a 10.4% share between them. If you want to succeed, find yourself a niche. SIMS has actually lost primary market share in each of the past three years. That makes sense, because it's also the area where they're experiencing the most competition. Scholarpack, for example, is an apologetically primary-focused solution: they don't have an exams module, so if you have a GCSE cohort, they wouldn't be able to handle your requirements even if you wanted them to. And RM's growth seems to be tied to an increasing primary focus: in the secondary market they're actually declining quite rapidly (they had 60 secondaries in 2010 but that had dwindled to just 27 by 2014). SchoolPod are also interesting - in 2013 they had three schools (a big academy, a studio school and a special school) but since then their growth to 20 schools has come about exclusively from special schools and PRUs. All this points to the fact that it's complex and costly to make a MIS that suits all schools, so it's understandable that some suppliers aren't even trying. The market may be tough to break in to, but that won't stop 'em from trying. A cautious tech entrepreneur might look at teh numbers and conclude that the English schools MIS market is more hassle than it's worth. But clearly caution is not in abundance in such circles, because since 2010, no fewer than TEN suppliers have decided to have a crack. 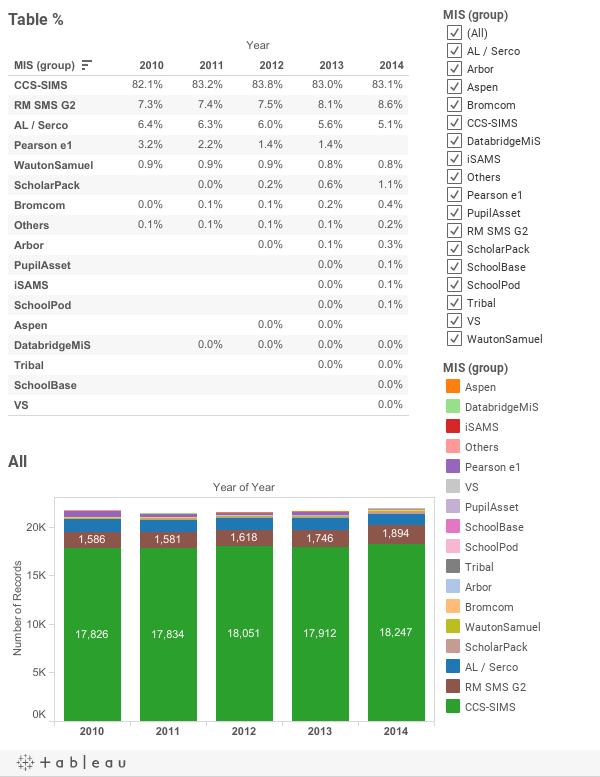 In order of popularity, they are: Scholarpack, Bromcom, Arbor, Pupil Asset, iSAMS, SchoolPod, Aspen (deceased), Databridge, Tribal, Schoolbase and VS. Between them they can boast almost 500 schools. Welcome, folks. ...Two. Yep, only Oxford (53% decline) and Cumbria (35% decline) have seen a significant change in SIMS market share in the past 5 years. Props to Scholarpack, RM and Bromcom, who have all won over schools in these LAs. And, to be fair, props to SIMS for maintaining such a strong position. But let's be clear: the story behind these data is not that LAs keep running big, open tendering exercises and SIMS keeps winning. I'm told that only two procuring bodies have actually used the government's IMLS procurement framework in the past three years. Of course, there are other procurement routes, but I don't think it's controversial to deduce from this that large-scale, open procurement processes are a rare beast in the English MIS market. Until this changes, the market will stay stifled. This brings me back to the conclusion from my last post on the subject: those of us who want to see more innovation in the MIS market have a responsibility to procure in a way that gives everyone a fighting chance of winning business. Personally, I'm an increasing fan of localised frameworks that give a subset of schools (one or more LAs or Academy Federations) the ability to purchase from a shortlist of approved suppliers. To their credit, Telford & Wrekin and Middlesbrough have both taken an approach along these lines, though Middlesbrough have also been open about the complexity of running such a process. But all challenges are surmountable - and LAs who share their experiences do the rest of us a commendable service, since we can all learn from how they've handled things. So whether you're a standalone school, an Academy Federation or a Local Authority, please think about the bigger picture when you choose your MIS. 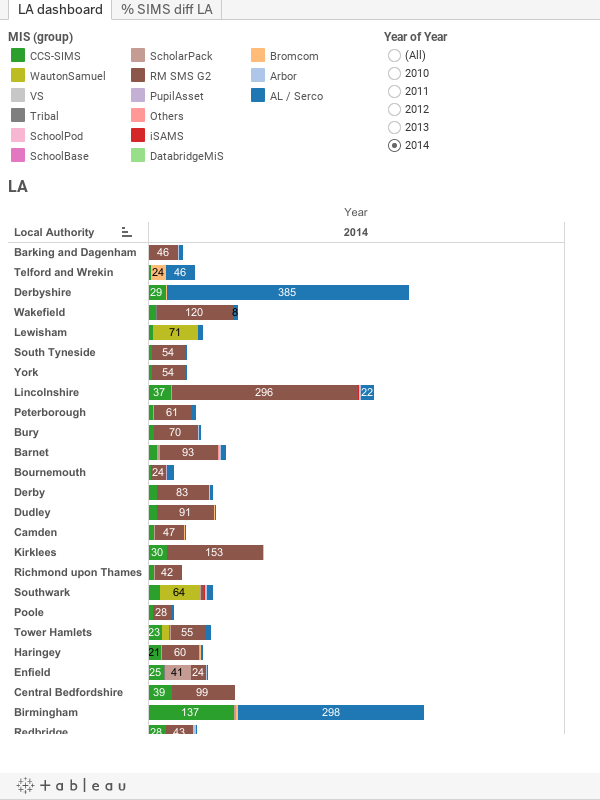 * The data used to prepare this blog came from FOI requests over the past five years, and most recently from the irrepressible Graham Reed. As well as helping to get hold of the data, Graham also kindly makes the raw data available to interested onlookers in a historized form. Graham works for Groupcall and also runs the Eduware Network. His Twitter handle is @grazreed. He is well worth a follow. Excellent and thought-provoking analysis as always Joshua. It opens up some interesting predictions for some and all the vendors over the next 12-18 months. Keep asking these questions (and I'll keep supplying the data! ).